The Cobra Night Watch has been one of the more interesting additions to the Enemy forces since the days of the Real American Hero line. While other new troop types like the CLAWS just didn’t seem to stick as time went on, the Night Watch has had its time in the spotlight (no pun intended) since the days of this Direct to Consumer release. 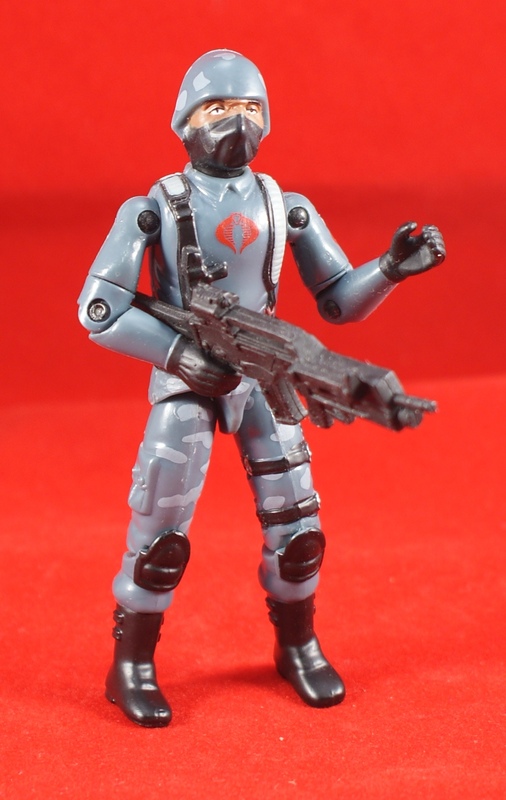 I like the idea of repainting plain-jane Cobra troops in different colors to suit mission specific situations. Apparently, this practice is quite in demand with many collectors, as evidenced by the popularity of the work of customizers like the Black Major. The mold isn’t the greatest in terms of what was used to make up for the missing 1983 parts. The same recipe of arms and waist from 1984 Roadblock had been used in a comic pack previously. The arms’ size fit in with the slimmer sculpt style of the early 80s, but they still just look like painted bare arms. Maybe the troops took to wearing skin tight Under Armor shirts that year. The arm issue is doubly baffling when you consider the Cobra Infantry six pack’s more effective appendage substitution. One of the coolest elements for me here, along with the blotchy throwback camo paint scheme and the reuse of old molds (gotta love the melon head and droopy eyes) is the variation in countenance. It’s refreshing to see some skin tone other than Caucasian flesh around a toy line. It’s even more of a rarity among the “bad guys”, and it was good to see Hasbro step out with something a little different. I can see myself getting this set at some point. 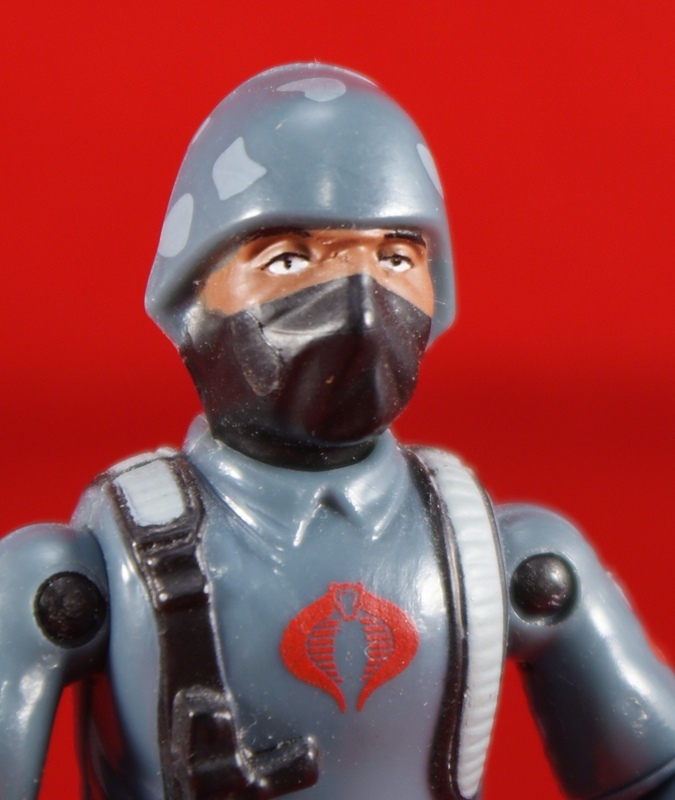 Love the variety in the cobra troopers. I’m a huge fan of the Trooper mold, and I love these guys. The arms are a weird sub, but the ’84 Roadblock waist works for me. Much better than the often used ’86 Roadblock one, which doesn’t fit any leg set well. The camo is cool, and who could deny that a bunch of hyper-caffeinated Cobra soldiers would be a force to be reckoned with? I only wish they’d found a way to include a scale espresso machine in the 6-pack. Man he looks reaaaaaally tired. It’s been a long Night Watch. Never understood why the rivets were painted black and not grey like the uniform. The weapons were designed for newer style figures and a bit of stretch for the hands.